Steven Gerrard has thrown down the gauntlet to teammates ahead of their clash with Arsenal. The former England international hints not everyone has been giving their all. “Everyone knows if we perform the way we have done of late against Arsenal we’ll get beaten,” admitted Gerrard. Meanwhile Adam Lallana feels the pressure too . Adam Lallana feels Liverpool’s Capital One Cup win at Bournemouth is ideal preparation for their clash with Arsenal. The England international midfielder believes Liverpool’s result and performance on the south coast means they’ll head into that encounter in buoyant mood. 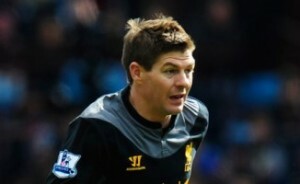 “This was a small step in the right direction and we’ll take it into the game on Sunday,” he told liverpoolfc.com. “We were so dominant in the first half, but they were always going to come out and have a bit of a spell in the second half. It was important we got the third goal because if it’d been 2-0 and they’d got their goal, it would have been an interesting last 20 minutes.